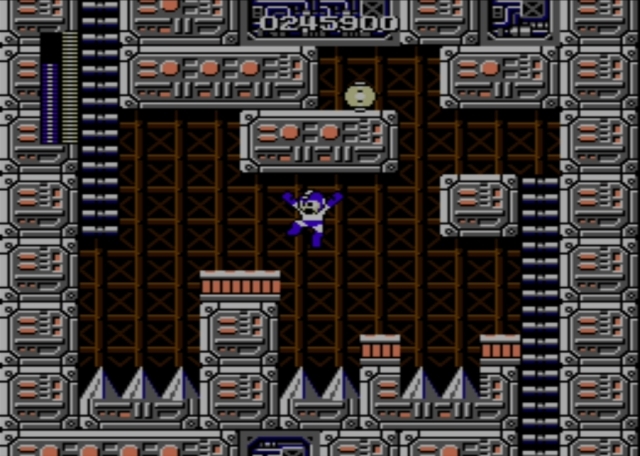 To clear this stage, you need to possess the Magnet Beam, which you should have obtained near the middle of Electric Man's stage. If you didn't do so, return there now before you proceed with your adventure. Running toward the castle, you'll find your progress barred by several of the familiar guardians that usually lurked around boss chambers. 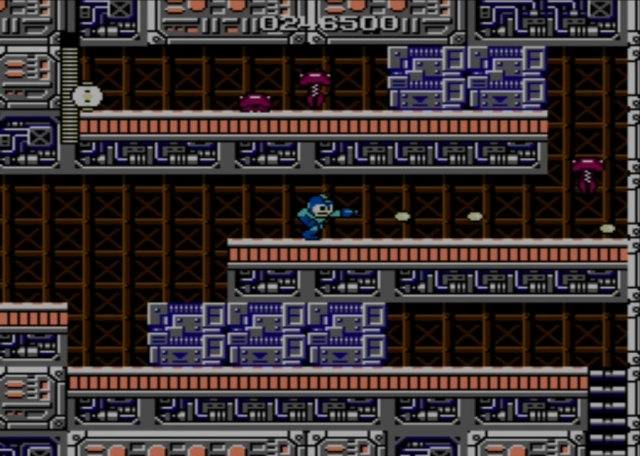 You can freeze them in place with the ice beam, though, and then hit them with a barrage of arm cannon shots to finish them off before they move again. It works best if you wait to freeze them until they're on ground level. 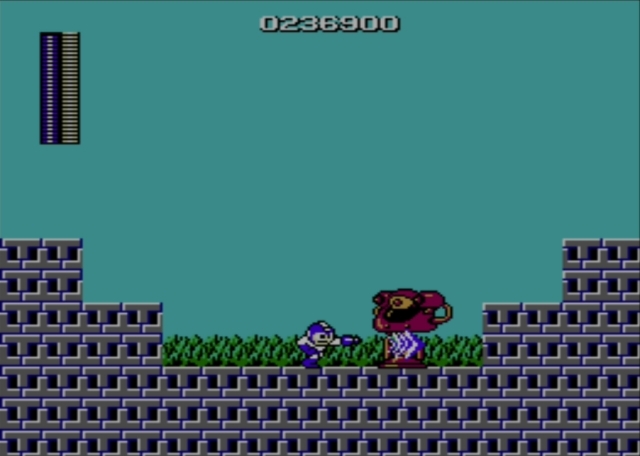 Past the thugs, you'll find a series of blocks you can remove using the Guts ability. Not all of them are at ground level, but you can jump and grab them while you're in the air. They're easy to get out of the way. The next hazard is a series of flame geysers. Make sure you have the ice beam equipped. 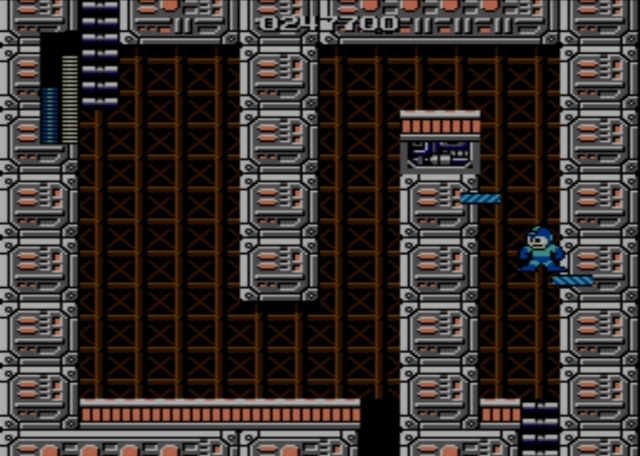 You need to fire as the beams are just about even with ground level, so you can walk across them and hop up to the next platform. Remember that your shots pass through the walls, so that should make things easier. It's not hard to reach the ladder to the upper right. Climb the ladder to reach a spike-lined corridor. It's best to climb to the top of the ladder and walk left from the block, then drop down and veer left to land just to the left of the rightmost set of spikes. Then it's safe to hop left over the middle spikes, then run and hop left and grab the ladder so you can climb into the next room. A series of springs rushes you in this chamber, but they fall quickly to your shots and you can keep moving right, blasting as you go. 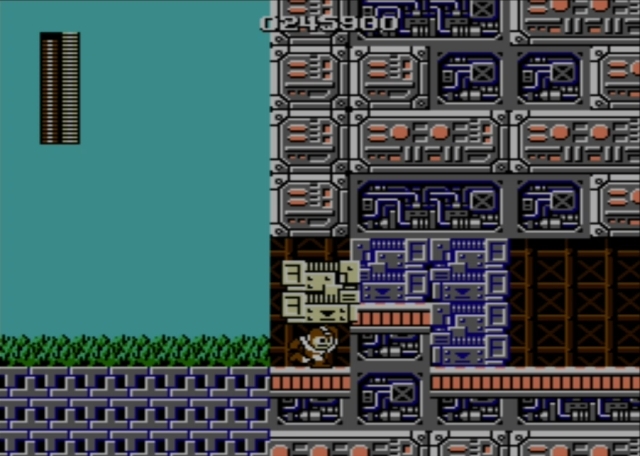 Use the Guts ability to remove blocks and access the ladder to your lower right. That ladder leads to a deceptively dangerous room. As you drop to the middle level and start toward the right, be mindful of the rockets that fly your way. Remember that shooting them makes them explode, and the blast will knock you back onto spikes. That would be okay in later games in the series, which grant you a period of invulnerability that applies even to spikes. However, things were different in this first game. Fortunately, you can freeze the rockets mid-flight with the ice beam. Just make sure to freeze one in an advantageous position, and then hop quickly over the spikes and descend into the next screen. This lengthy corridor has spikes along both its base and on the ceiling. 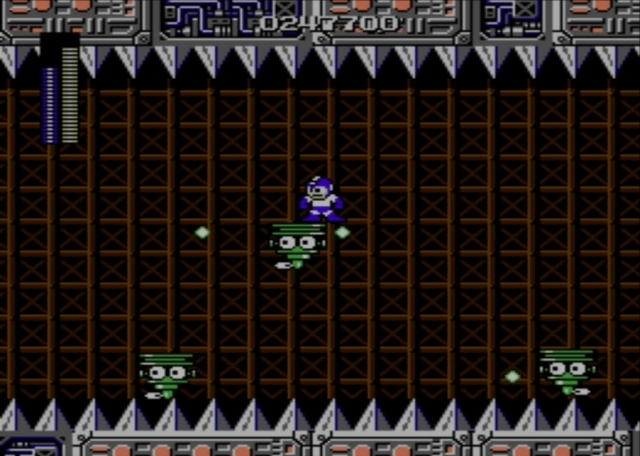 You have to proceed by hopping on the floating green enemies, which previously you've seen hovering over wide pits, and in a different hue. Remember all the old rules that applied. Don't let their shots knock you off and send you plummeting to the spikes. Ride them all the way to the right, and climb a ladder into a noteworthy new room. This is the area where you need the magnet beam. You can use it to climb the shaft that extends upward from the top of the ladder, and a second shaft along the room's left side. 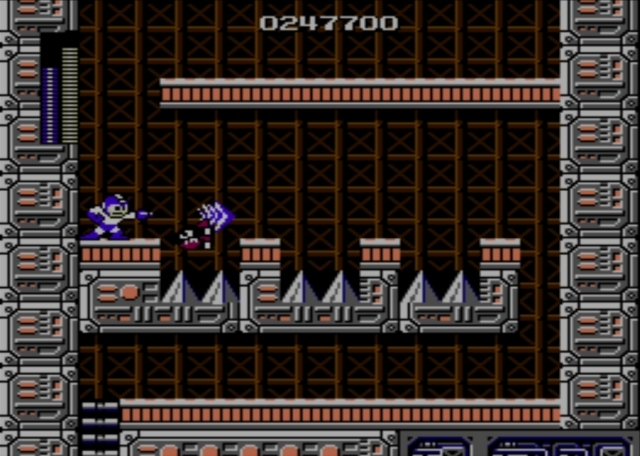 When you fire the beam, a ledge temporarily appears a short distance away from you, at the desired elevation. So you can use three or so beams to ascend the one shaft, then three more on the next one. 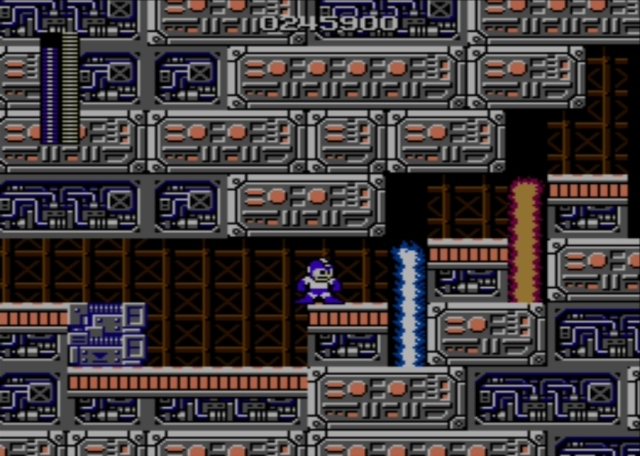 Remember: the beams appear a set distance away from you, and do not attach to walls like similar equipment does in later Mega Man games. Once you exit that room, just head down the hallway to the right to find the castle's first boss battle. This is a boss monster Capcom's developers liked so very much that they brought it back for an encore in the franchise's third installment. There, however, you have energy tanks that make the fight more manageable. Here... you do not. As you enter the screen, start toward the right. Plan to leave space equal to about three or four of yourself, side-by-side, and keep an eye to the left side of the screen. Orange blocks will start flying in from that direction, toward the screen's right side. You want to jump some and let others sail overhead. 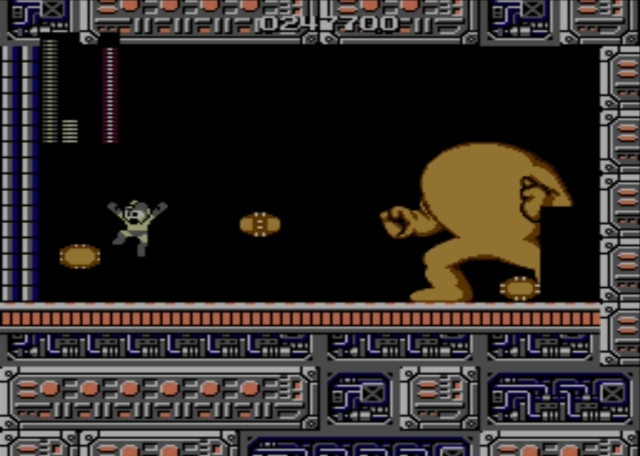 To your right, they'll slowly form a giant made of stone (sometimes called the "yellow demon"), which you can then briefly hit once an eye appears and it fires a shot in your direction. Because there are long, frequently recurring segments in the fight where you are likely to sustain severe damage while the boss is impervious to all attacks, this fight feels unnecessarily cheap. Counter that by using "the pause trick," which means you fire a shot with the cutter blade and then pause the action just before it should hit the target's mushy eyeball. Now, quickly mash the pause button repeatedly, which will cause the blade to very slowly pass through its target. You can score multiple hits (over an extended period) before the blade finishes its pass. In this way, you should be able to defeat the demon after it forms only two or three times, which is still no simple feat but at least feels manageable.